If you’ve come to this page, you’re likely researching how to build a tree house, but you need some help getting started. If you are considering building a tree house yourself, there are many structural and safety considerations which should not be taken lightly. Tree Top Builders strongly advocates safe tree housing, so if you are committed to building a tree house on your own, or with the help of a local contractor, why not talk to Tree Top Builders to get you started safely? Installing the decking and a ladder for access to the tree house. Have you (or someone you know) been thinking, talking, and planning to build a tree house, but never actually started building? Don’t dismay, some people just need to be pointed in the right direction to have confidence that their tree house will be safe and not kill their tree. 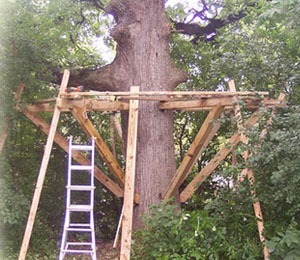 If you have a stalled tree house project, contact us to help get it done this year. We enjoy working with various skilled craftsmen all over the country and we will be happy to get your tree house started right and then let your builder take over. This may save you some money if we are traveling great distances and if your builder has lower building rates. If not, it probably makes sense for us to complete the tree house – that is, after all, what we are very efficient at doing. If you want to build a tree house yourself, we want you to be successful and want to help you achieve a safe and tree friendly result. So let us know how much help you realistically need in order to have the confidence to complete your tree house and we’ll be happy to play the ideal role for you.